Remodeling Slideshows for Kitchens, Baths, and others! Mills has been a steady performer. Millis is up about 38% from the lows, and it's rise has been steady. Which makes sense! Its small and hard to get to, but makes sense for lots of folks. There's just enough that doesn't work to keep things from getting crazy - but plenty of things that do work to keep prices moving. Ultimately, the HSI has come down from the peak, but things are still good for sellers - just not crazy good. If Millis works for you, the market isn't overheated. There just aren't lots of options. Traffic is light, but buyers are moving quickly for the right property. Even homes that don't sell right away find buyers quickly. Getting your home presentable and priced right will improve your experience. Going to high is likely to deter buyers. There are 19 homes currently listed as For Sale by Home Sellers. 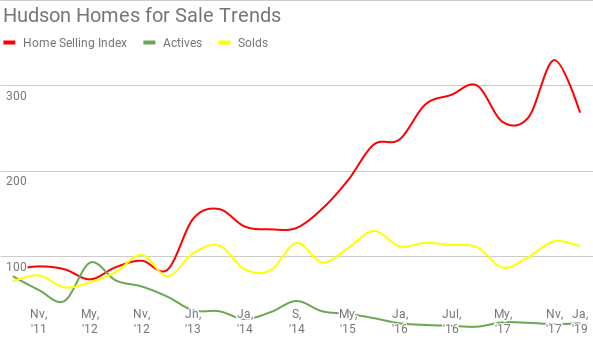 In Millis there have been 58 houses sold in the last 6 months, and 27 homes sold in the last 3 months. The Average number of Days on Market (DOM) was 28 days for the last 6 months of SOLD homes In Millis . Homes for sale have been looking for buyers for an average of 76 days (the homes currently for sale). There was an Average Sold Price of $474,102 . What are the true dangers lurking in my house? How Dangerous are they? Meet Matt! His approach explained. Read my Explanation for Massachusetts Home Data Reports. The Milford chart looks very different from Medfield. 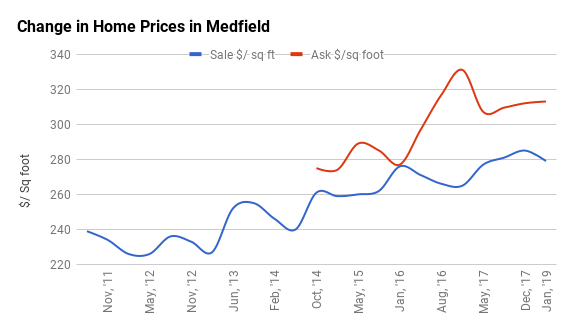 Just about the time prices stopped going up in Medfield, they started a new surge in Milford. In Milford, affordability is much less of an issue, with prices still under $200/ sq foot, not the $300 they are getting in the more expensive areas. In this case, the lack of inventory is having an effect on prices. While the HSI remains above 300, we'll probably continue to see rising prices this year. What should potential home buyers do in Milford? Home buyer in Milford will see lots of competition, so know what you want and examine things closely first go around - you won't get a second look. And if you can, examine properties that need a lot of work - they are selling below where they should, so there's equity opportunities there. What should future home sellers do in Milford? The home selling is easy in Milford. It's find a place to go that's tough! There are 20 homes currently listed as For Sale by Home Sellers. In Milfordthere have been 153 houses sold in the last 6 months, and 81 homes sold in the last 3 months. The Average number of Days on Market (DOM) was 30 days for the last 6 months of SOLD homes In Milford. Homes for sale have been looking for buyers for an average of 102 days (the homes currently for sale). There was an Average Sold Price of $365,413 . Milford, MA, has 0 properties advertised as lender owned or foreclosure (typically foreclosure) . Here in Medfield, an expensive town in my area, as it lies closer to Boston, we see that prices are having trouble moving up. After a great run, moving from 220 to 280, they remain about where they were for the past 2 years. Sellers expectations have come down - and stay down. So what's up in Medfield? Well this report shows that there is a limit to the affordability of housing, and this part of Massachusetts has been bumping up against that limit. With a limit to the number of buyers that can pay $300/ sq foot, and those buyers having options elsewhere, they are either choosing to get less in other towns or choosing to pay less in other towns. 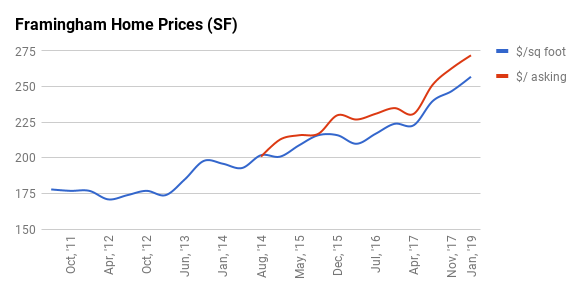 Either way - Medfield has been capped out, and it'll stay that way until there's more demand, which could happen with rising prices to the east, or continued falling supply. That won't be easy though -supply remains at record lows. The market is as good for sellers as ever - but the prices rises aren't happening. In fact, if you look at the data, there's some signs there that we are topping out. Average sale price dropped - showing that the lower stuff is moving quicker than the higher priced stuff - and the current average days on market for actives is 120 days - not the 75 we are used to seeing. What should potential home buyers do in Medfield ? Recognize that there is softness in the upper levels of the market. More sellers than buyers. Lots of competition in the lower levels however. Sign me up for Automated E-mail Alerts of New Listings in Medfield! What should future home sellers do in Medfield ? 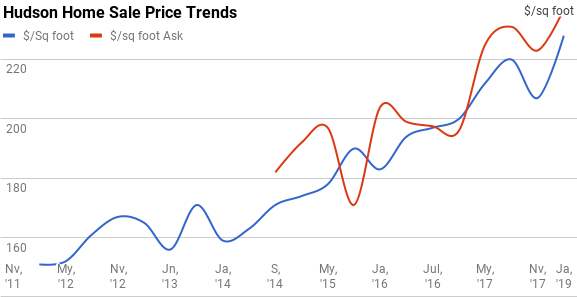 Some parts of the market are competitive, and if your home isn't priced right, you're going to sit - potentially for months. Some luxury homes will find the demand very soft. Be smart about how you evaluate your competition - it's not just in Medfield. 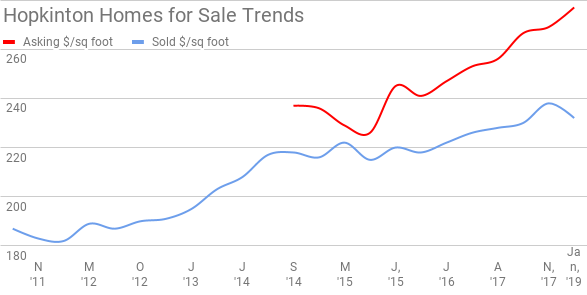 In Medfield there have been 99 houses sold in the last 6 months, and 46 homes sold in the last 3 months. 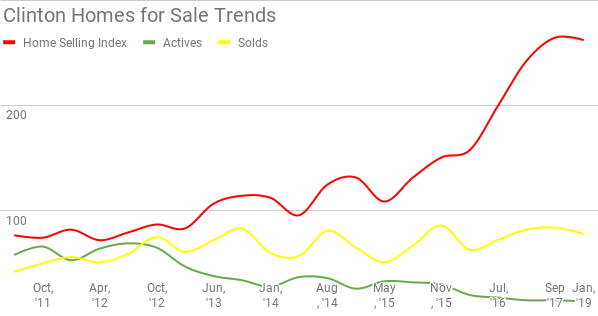 The Average number of Days on Market (DOM) was 45 days for the last 6 months of SOLD homes In Medfield . 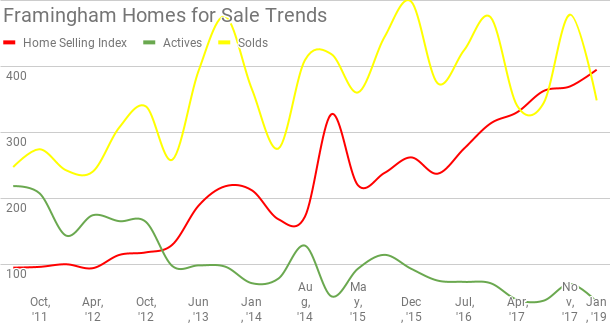 Homes for sale have been looking for buyers for an average of 125 days (the homes currently for sale). There was an Average Sold Price of $719,361 . Medfield , MA, has 0 properties advertised as lender owned or foreclosure (typically foreclosure) . Still, we can see the cooling off here as well from a scorcher of a market. 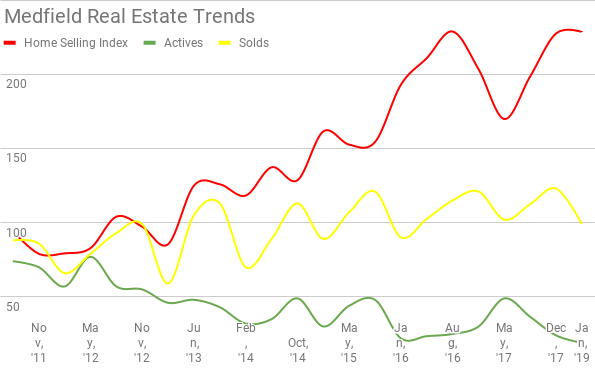 Transaction volume remains the same, so listings are beginning to trickle on. Not enough to cool things off, but enough to move the market from impossible to difficult for buyers. What should potential home buyers do in Marlborough? Watch the prices! Marlborough has run a long way - it's a bit frothy here, and there are some towns that I think are more expensive - but may be a better value down the road. Sign me up for Automated E-mail Alerts of New Listings in Marlborough! Is this an Old Report? Get the latest! What should future home sellers do in Marlborough? It's a great market for sellers. Prices are at all time highs, and there are still lots of buyers. There are 39 homes currently listed as For Sale by Home Sellers. In Marlborough there have been 169 houses sold in the last 6 months, and 89 homes sold in the last 3 months. The Average number of Days on Market (DOM) was 22 days for the last 6 months of SOLD homes In Marlborough. Homes for sale have been looking for buyers for an average of 109 days (the homes currently for sale). There was an Average Sold Price of $417,945 . Marlborough, MA, has 4 properties advertised as lender owned or foreclosure (typically foreclosure) . When we look at the data chart, we see the HSI isn't climbing any more - but peaking out at 300, which is kinda nuts, it's really got nowhere to go. Well above 250 means all clear for sellers. What should potential home buyers do in Hudson? Sign me up for Automated E-mail Alerts of New Listings in Hudson! What should future home sellers do in Hudson? I mean, you have to think about it right? This is a great time to cash out - if you've got moving on the mind. There are 22 homes currently listed as For Sale by Home Sellers. In Hudson there have been 112 houses sold in the last 6 months, and 65 homes sold in the last 3 months. The Average number of Days on Market (DOM) was 28 days for the last 6 months of SOLD homes In Hudson. Homes for sale have been looking for buyers for an average of 59 days (the homes currently for sale). There was an Average Sold Price of $404,324 . Hudson, MA, has 2 properties advertised as lender owned or foreclosure (typically foreclosure) . Hopkinton looks a little out of whack. When you look at what sellers are asking for, it seems like a stretch. But it's driven largely by the asking prices in Legacy Farms - which buyers are paying - but probably shouldn't. The drop in inventory has pushed Legacy Farms to high prices, as the last parts of Middlesex county continue to climb. Is this a new normal? Only time will tell, but I think there are certainly some things that will change when the inventory returns. What should potential home buyers do in Hopkinton? Be very cautious when getting new construction! Those prices are not lined up with the rest of the market. Sign me up for Automated E-mail Alerts of New Listings in Hopkinton! Show Me Updated Hopkinton Home Sale Reports and More! What should future home sellers do in Hopkinton? Home sellers should be able to get mega good prices, as they remain near all time highs, up 10 % in just a few years. There are 30 homes currently listed as For Sale by Home Sellers. In Hopkinton there have been 148 houses sold in the last 6 months, and 69 homes sold in the last 3 months. The Average number of Days on Market (DOM) was 62 days for the last 6 months of SOLD homes In Hopkinton. Homes for sale have been looking for buyers for an average of 179 days (the homes currently for sale). There was an Average Sold Price of 726,756 . Hopkinton, MA, has 1 properties advertised as lender owned or foreclosure (typically foreclosure) . 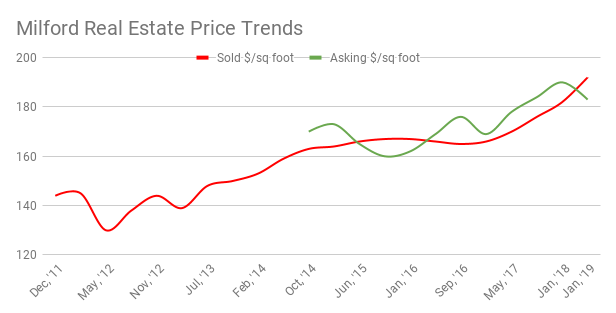 Prices are moving up, but not as quickly as in other places. Looks like there's some debate about where they can go. What should potential home buyers do in Holliston? Home buyers need to be aggressive - the limited inventory, and rising HSI mean there will be bid wars for properly priced property. Sign me up for Automated E-mail Alerts of New Listings in Holliston! What should future home sellers do in Holliston? There are 26 homes currently listed as For Sale by Home Sellers. In Holliston there have been 123 houses sold in the last 6 months, and 56 homes sold in the last 3 months. 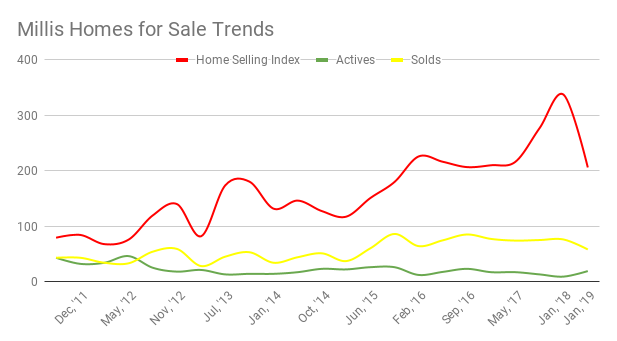 The Average number of Days on Market (DOM) was 37 days for the last 6 months of SOLD homes In Holliston. Homes for sale have been looking for buyers for an average of 203 days (the homes currently for sale). There was an Average Sold Price of $553,413 . Holliston, MA, has 3 properties advertised as lender owned or foreclosure (typically foreclosure) . 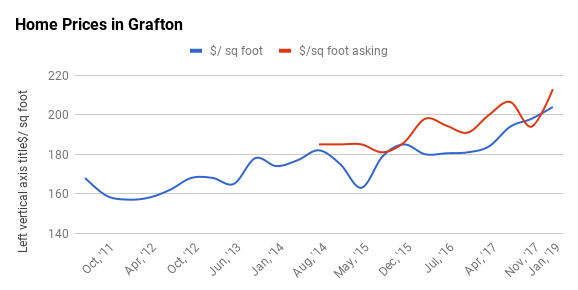 The green line over the 7 years tells the story for Grafton. The number of homes for sale is about 60-65% less than that time, and as scarcity has shown up, the market has improved for sellers. 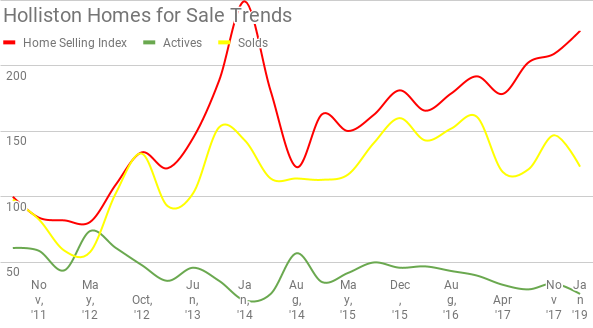 Note that transaction activity is pretty constant - there aren't more sales, just fewer sellers each year. 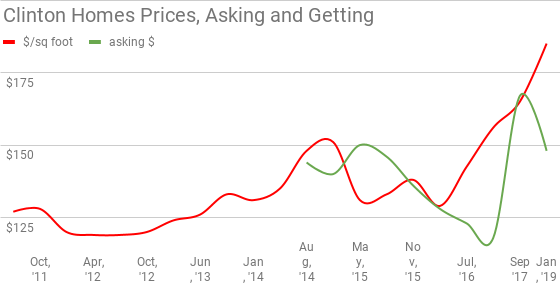 Prices continue to rise, and buyers continue to demonstrate they will pay more. What should potential home buyers do in Grafton? Home buyers will find Grafton isn't the tightest market covered here - and prices remain quite reasonable, relative to many towns just to the East. Prices just now - 14 years after the last peak - are above where they were, but it has been a long slog. This market is not overheated - and buyers who do their research are getting good value in Grafton. Sign me up for Automated E-mail Alerts of New Listings in Grafton! Show me Recent Grafton Reports! What should future home sellers do in Grafton? Home sellers will find a good - but not a great market. Well priced homes are moving quickly, especially those that look their best. There are 37 homes currently listed as For Sale by Home Sellers. In Grafton there have been 114 houses sold in the last 6 months, and 58 homes sold in the last 3 months. The Average number of Days on Market (DOM) was 42 days for the last 6 months of SOLD homes In Grafton. Homes for sale have been looking for buyers for an average of 105 days (the homes currently for sale). There was an Average Sold Price of 437,132 . Grafton, MA, has 2 properties advertised as lender owned or foreclosure (typically foreclosure) . Sellers are being careful not to get too optimistic, but they are asking more. Buyers are getting pickier, which is why homes that aren't selling, are not selling for longer. What should potential home buyers do in Framingham? With a market this hot, buyers should be very careful, with single family prices, multi-family prices, condo prices, and any other high risk locations. If inventory starts to increase, this market will stall. Sign me up for Automated E-mail Alerts of New Listings in Framingham! What should future home sellers do in Framingham? It's still important to price your home right. 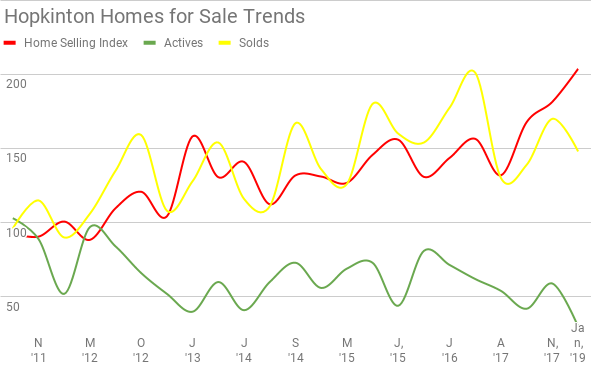 The number of sellers who aren't "adjusting" to where the market values their home is rising - but home buyers aren't interested in houses that are clearly out of line with the market. There are 43 homes currently listed as For Sale by Home Sellers. In Framingham there have been 348 houses sold in the last 6 months, and 183 homes sold in the last 3 months. 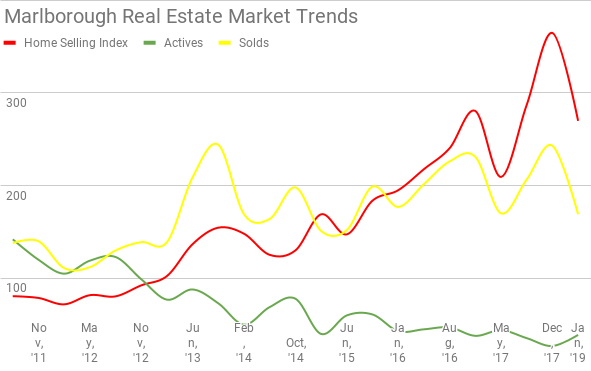 The Average number of Days on Market (DOM) was 19 days for the last 6 months of SOLD homes In Framingham. Homes for sale have been looking for buyers for an average of 124 days (the homes currently for sale). There was an Average Sold Price of $480,243 . Framingham, MA, has 4 properties advertised as lender owned or foreclosure (typically foreclosure) . Amazingly, you could get good deals in Clinton is as late as 2015. But buyers finally noticed, (they always do) and prices have been up sharply since. Note that current asking prices are lower than current sale prices. That is largely because buyers are happy to pay top prices for good condition, but they are not buying homes that need work. The homes that are not selling mostly or totally need major improvements, and have to sell far below the average sale price in this market. What should potential home buyers do in Clinton? Well, I'd look over some of the properties that need work. There could be some real bargains out there. With so few houses on the market, it will be a brisk spring in Clinton. Sign me up for Automated E-mail Alerts of New Listings in Clinton! Show Me Updated Clinton Home Transaction Reports and More! What should future home sellers do in Clinton? Home sellers will find a receptive market - if your home is in good shape! Homes that show poorly will sell much lower. There are 14 homes currently listed as For Sale by Home Sellers. 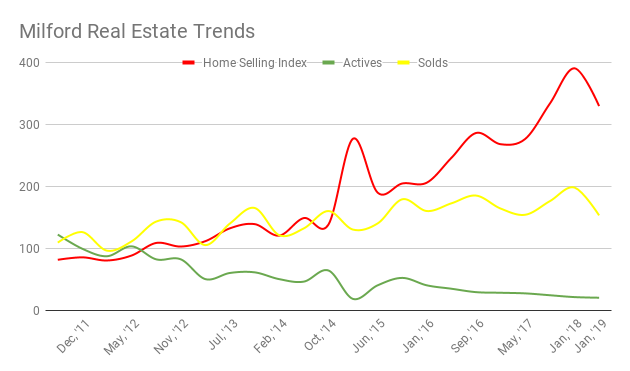 In Clinton there have been 78 houses sold in the last 6 months, and 42 homes sold in the last 3 months. The Average number of days on Market (DOM) was 34 days for the last 6 months of SOLD homes In Clinton. Homes for sale have been looking for buyers for an average of 82 days (the homes currently for sale). There was an Average Sold Price of $327,162 . Clinton, MA, has 3 properties advertised as lender owned or foreclosure (typically foreclosure) .